They inhabited the southern Ural Mountains around 4000 years ago, living challenging lives that appeared to revolve around breeding horses, cows and sheep. But what has proved most remarkable about these migrants was their comparatively short lives. Excavations of their tombs found no-one appeared to have survived beyond 50, with 70% of them dying as children. Artifacts from the Bronze Age in the Southern Urals have been the object of active research for several decades by archaeologists from around the world. For the last decade, scientists of South Ural State University, together with international colleagues from the US and Germany, have been researching a synchronous necropolis, known as Kamenny Ambar-5, located 280km from Chelyabinsk, a city in west-central Russia. Modern genetic techniques have allowed researchers to reveal some remarkable insights. Kamenny Ambar is a Bronze Age settlement in the Kartalinsky District, on the left bank of the Karagayly-Ayat River. Four thousand years ago, it was inhabited by people with a specific lifestyle, unique cultural traditions and world view. The reinforced settlement and funerary complexes they created are of special interest for archaeologists. “Modern archaeology is a very dynamic discipline,” says Andrey Epimakhov, a professor in the Department of Russian and Foreign History at South Ural State University (SUSU) who has supervised excavations at the site. “Today, interdisciplinary research plays a big role. For example, aside from researching environment and living conditions of ancient people, we also research their social relations. Our goal is to extend the existing knowledge and discover new aspects of life of the ancient population. 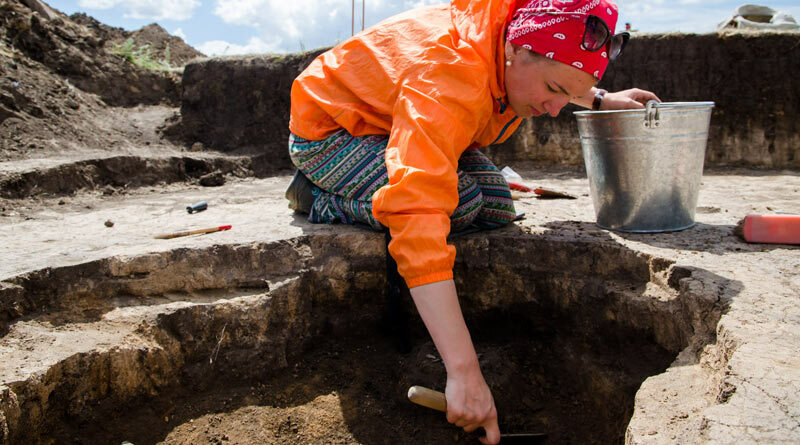 The international team, consisting of researchers from SUSU and the University of Pittsburgh, have been focusing on remnants discovered in the Kamenny Ambar-5 burial ground. Physical anthropologists carried out a thorough study with the goal of determining each individual’s age and race, as well as whether they had any diseases or injuries. “One of the mysteries of this burial ground is the fact that there are no adult people older than 50, and about 70 percent of the buried are children of various ages. The researchers collected a large amount of DNA material. Mapping of the genome determined the gender of the children. Geneticists verified archaeologists’ theory that girls were buried with ornaments, and boys with labor tools. Research of remnants of the Kamenny Ambar residents showed that socialization and separate formation of gender stereotypes was beginning at the age of two or three. “The remnants were also studied for the presence of any diseases, but no traces of epidemics or dangerous illnesses have been detected,” he says. Military equipment was found on the excavation site: a spear and fragments of chariots. But a thorough study showed that these items were not used in combat. Scientists suggest that a fast life history was an adaptive regional response to a less hospitable and perhaps unstable environment. According to one theory, this was a group of migrants who came to the territory of the contemporary Southern Urals. If so, where did they come from and what did they do? Migration during the Bronze Age was a quite difficult process. It was gradual, and the process involved representatives of various cultures. Today, scientists know that migration moved from west to east. But whereas the features of a series of the Eastern Europe’s cultures are visibly traced genetically and by their cultural aspects, strangely enough, similarities were discovered with nations of Central Europe (the territory of contemporary Germany and Poland). “Reconstructions of skulls were carried out, and now we can visually demonstrate the look of the population,” Epimakhov says. “The remnants were found in the Kamenny Ambar burial ground. They were southern representatives of European ethnicity with a well-shaped facial skeleton and protruding nose,” continues Epimakhov. The researchers also managed to check the hypothesis that inhabitants of the settlement were livestock breeders and agriculturists. The researchers collected macro-remnants of many plants. Analyses showed the absence of cultivated crops, which debunks the theory about farming. “We were able to determine that they were picking wild plants and partly practiced fishing and hunting. But these activities were supplementary; their lives were founded on breeding cows, sheep and horses. “Therefore, with a high degree of certainty, we can say that they were sedentary livestock breeders,” Epimakhov says.